Krishan Gupta is highly qualified with B.A. Bachlers of Arts: Major : Economics & Political Sc. J.D : Professional Law Degree , & H.R.C. : Hotel/Restaurant/Culinary ( U.S.A) He is also known as "Guru" .The word "Guru" evokes something exotic ,exciting and full of knowledge. 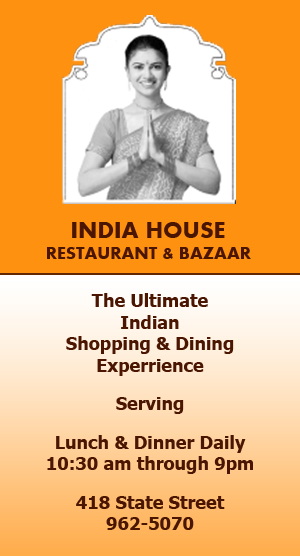 Here we have a great combination of his exotic personality , exciting features and the knowledge of real taste of India . He blends together his all three knowledge and creates the best Indian food any where in California. Krishan is one of those who have won millions of heart by cooking. Now he brings world-class culinary experience from Copenhagen, Lund, London, Paris ,Munich, Berlin, New York , New Jersey to Santa Barbara, California. His fans are from Bollywood to Hollywood . Stars came a s guest and left as friends are few to name it as : Amitabh Bachan, Micheal Jackson, Katie Perry ,John Hillarman, Sir Anthony Hopkins, Russel Brandt and many more. In 2000 , Krishan was selling India items and restaurant decorative items in California with a motive to find a RIGHT place to open a restaurant in Santa Barbara. His memories of grand-mom's tasty meals and his international Culinary experience have always been his passion to make friends with traditional flavors the way to enjoy real authentic Indian Cuisine. Mixing of spices and knowledge of Indian food is not only the taste but also the surrounding and the atmosphere in which you enjoy and feel yourself in Seven Heaven. The genesis of Krishan can be traced back from 1982 where he started making Chai (Indian Tea)in Copenhagen .Then in Lund (Sweden) making Pakoras and Chai. Shopping for his West-Berlin restaurants in London and eating in different Indian Restaurants added more European view for Indian food. Krishan became very famous in West-Berlin when he opened his first super class Restaurant "Tandoory" and then his second Restaurant "Ganges". Very popular and signature dishes were "Channa Masala"(chick peas)" "Paneer Jalferzi"(home-made cottage cheese with fresh vegetable) "Chicken Tikka Masala" "Chicken Vindaloo" "Shrimp-Curry" " Reshmi malai kebob" and "Fish Amritsari ". These dishes became famous not only because of their super authentic KANPURI taste but also the right kind of bread served and Basmati Rice made in different variety to match with these dishes. For Now Our Chef Krishan is at your service in India House, Santa Barbara, California.